A Middle School Survival Guide: Microscope Lab! order containers of Daphnia and Hydra! I didn't go into much detail for the students, but basically it was cool to see the Daphnia's heart beat (About 180 bpm!) and it's spine/eyes etc. And here they are together...over the course of a few minutes as the Hydra and Daphnia were added o the same slide, the Hydra moved toward the Daphnia and put it's tentacles around it! That's it. Then they both died on the slide. On a sidenote, how cool is it that my i-phone was able to take pictures through the eyepiece of the microscope? Gotta love technology. awesome! i will remember this for next year when i do my microscope lab! Hey! I changed the name of my blog piece-of-cupcake-life! Here's my brand spankin new URL! We teach a wetlands unit and the students LOVE to watch the Daphnia - we are also fortunate enough to get damselfly nymphs and we do watch the daphnia eat them. 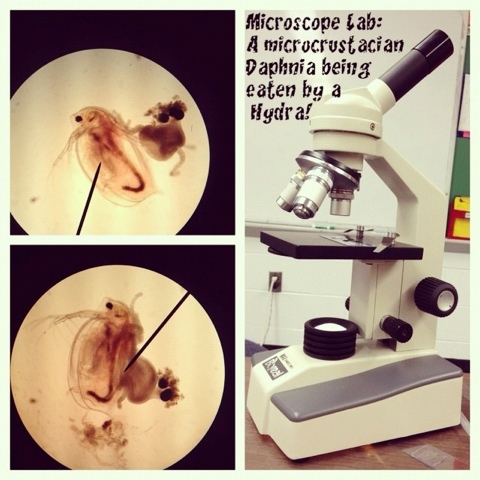 This is so cool and really makes me want to learn more about daphnia and hydra. Also cool that your iphone took really great shots. Go iphone. I want to use an image of a hydra "embracing" a daphnia on the next shirt I paint. What should be the caption underneath? Hmmmm...any suggestions? That is great! Thanks for the tip about your iPhone able to take a photo. AWESOME!